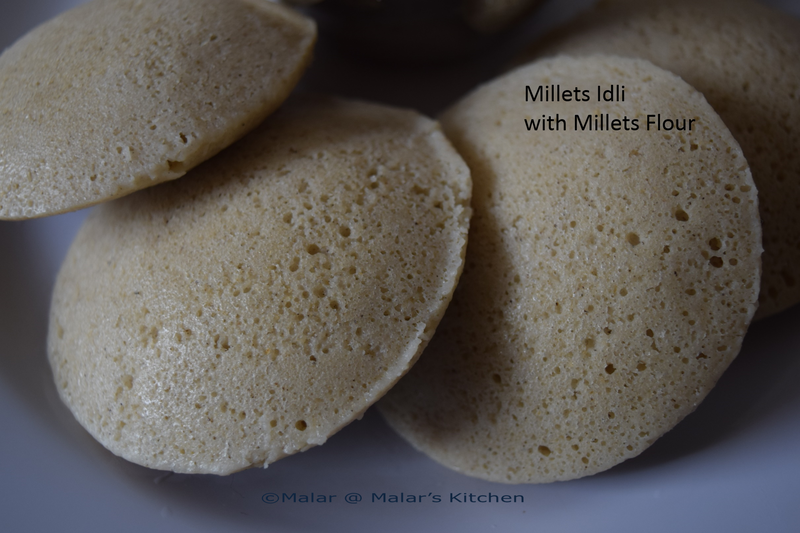 Most of my blogger friends have been posting on this millets idli, dosa. I was so impressed and wanted to try it. I somehow couldn’t find millets in market. Maybe I am not looking at the right place. Or I would forget to buy it. 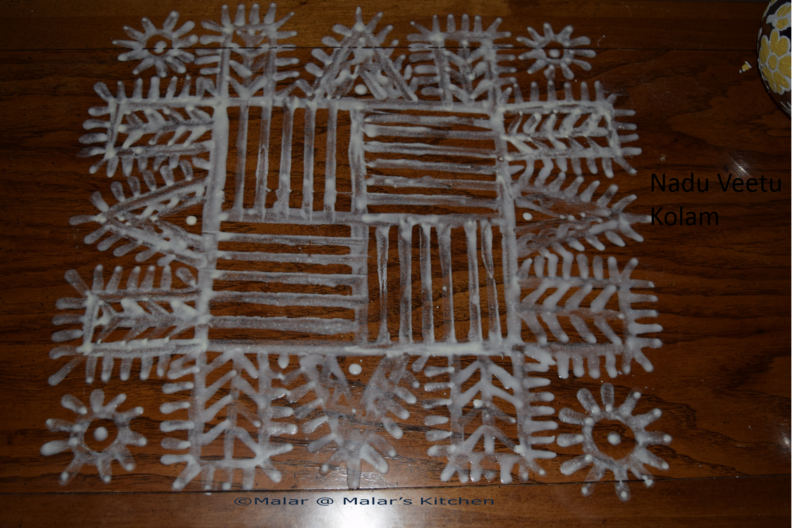 But when ever we visit Indian store we always find the millet flour pack readily available. 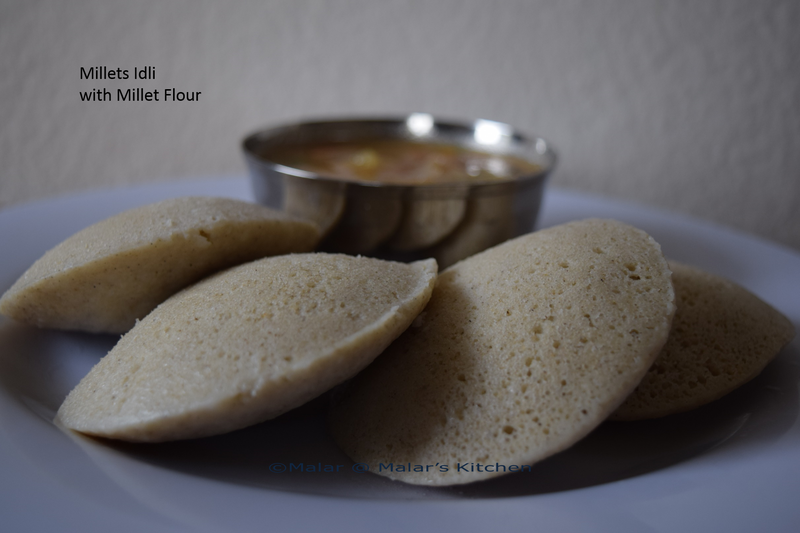 When Ragi idli/Dosa can be made with ragi flour, why not millet idli with millet flour. So I gave it a try and we liked it. 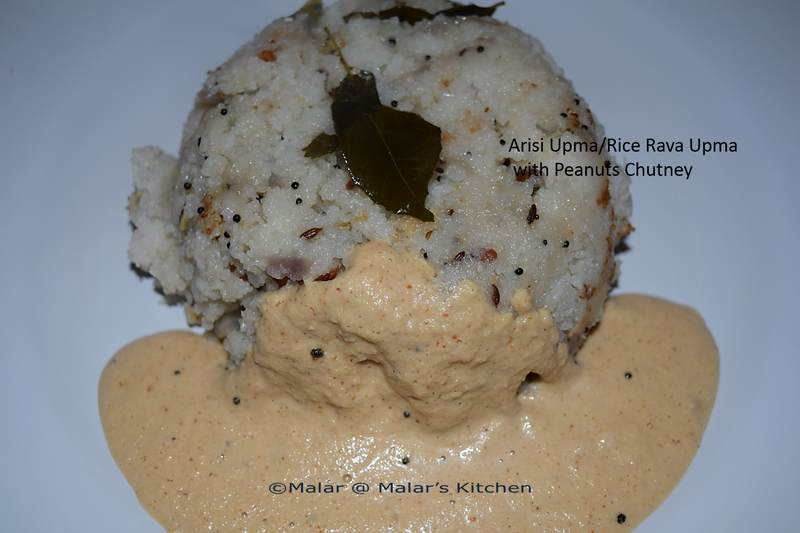 Here is the recipe..
Soak idli rice for 5 hours. Urad dal for 45 mins to 1 hr. 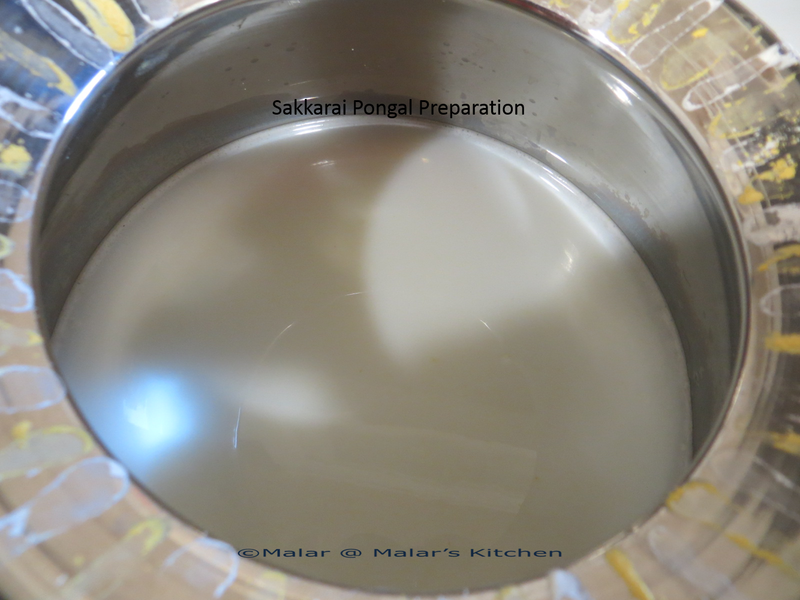 Once it turns to be a soft batter, remove and in a medium mixing bowl, add the batter with millet flour, salt. If needed mix water and make sure not to have lumps. Also make sure the batter is not too thick nor runny. Allow it to ferment for 8 hours in a warm place. In a idli maker, grease idli plates with oil. Pour batter and steam for 10 to 12 mins in high. 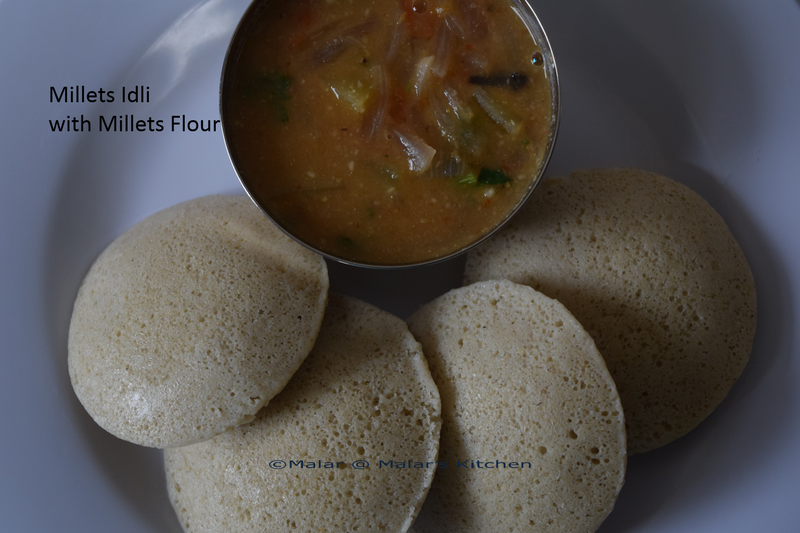 Remove idli’s from idli plate and serve. Serve it with any gravy or chutney. 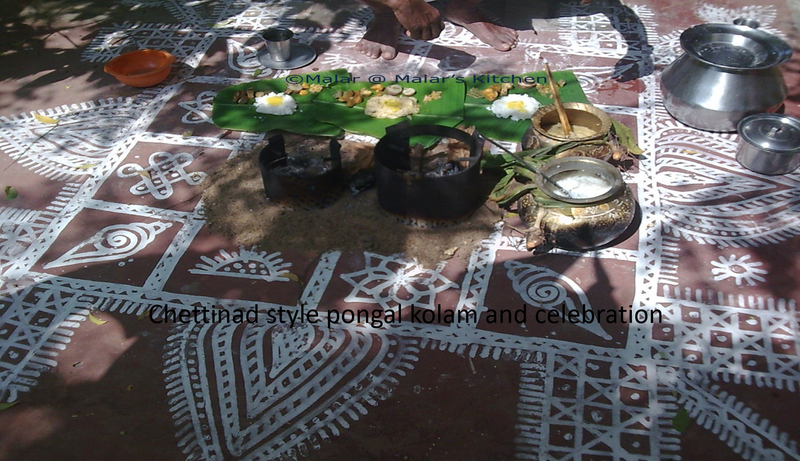 I served with Vengaya kose, a chettinad gravy which is prepared for breakfast. 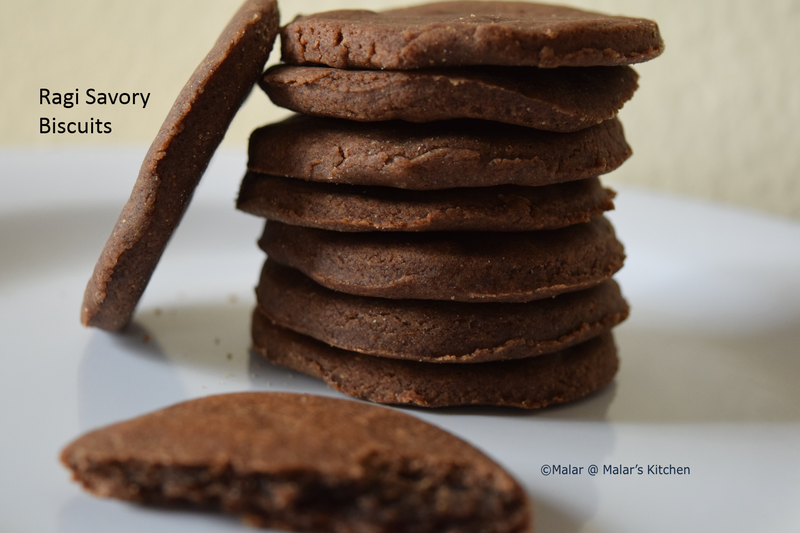 Recipe to follow soon. Make sure not to burn the flour, keep stirring. Leave it to cool after roasting. Next in a medium bowl, sieve the roasted ragi flour. Add wheat flour, red chili powder, salt and sugar. Mix well. Now add yogurt, oil to the flour and mix. Then slowly add water and make a soft dough. Meantime preheat oven to 400F and line the baking tray with parchment paper. Spray with cooking oil. Now in a surface sprinkle some flour. Divide the dough to 3 parts. Roll the dough on the surface and take a cookie cutter ( I used just a small bowl to make round shape) and cut the dough to desired shape. I could get around 20 pieces. It depends on the size and shape which you are preparing. Oil can be replaced with butter. Red chili powder can be replaced with green chili paste. If desired instead of yogurt, egg can also be added. For sweet version add sugar more with just a pinch of salt and cut down chili powder. 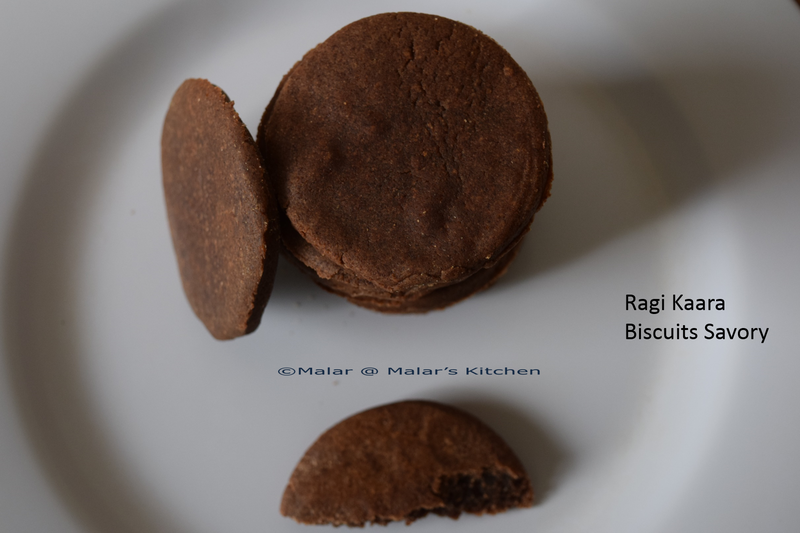 If you want a gluten free, cut wheat flour and add ragi flour instead. 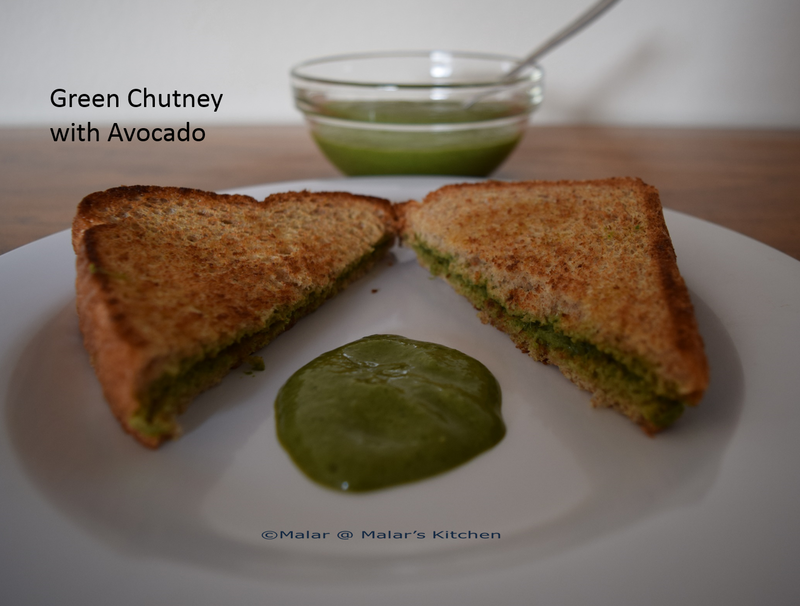 Who doesn’t love green chutney? 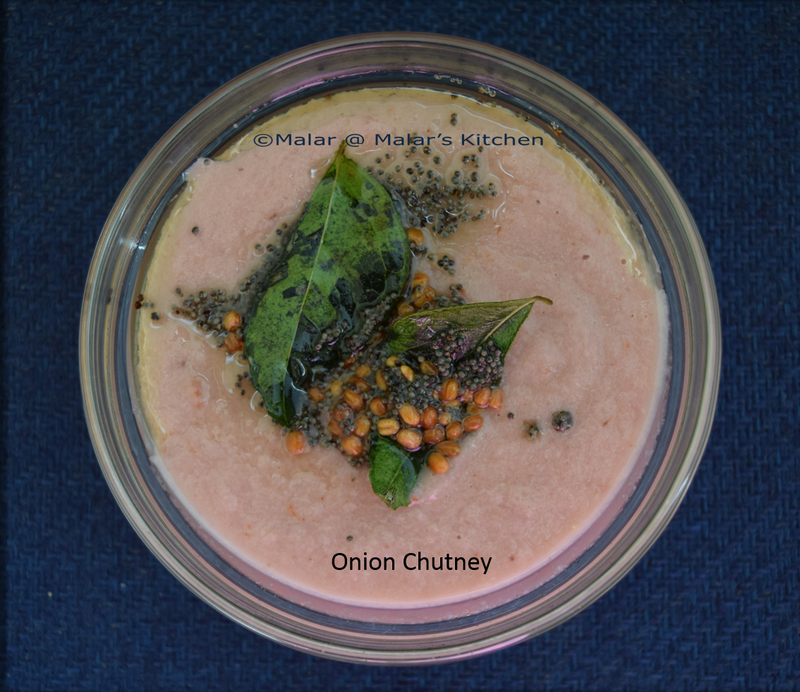 I hope I am not biased 😉 , but as far as I have seen many of us love this chutney. 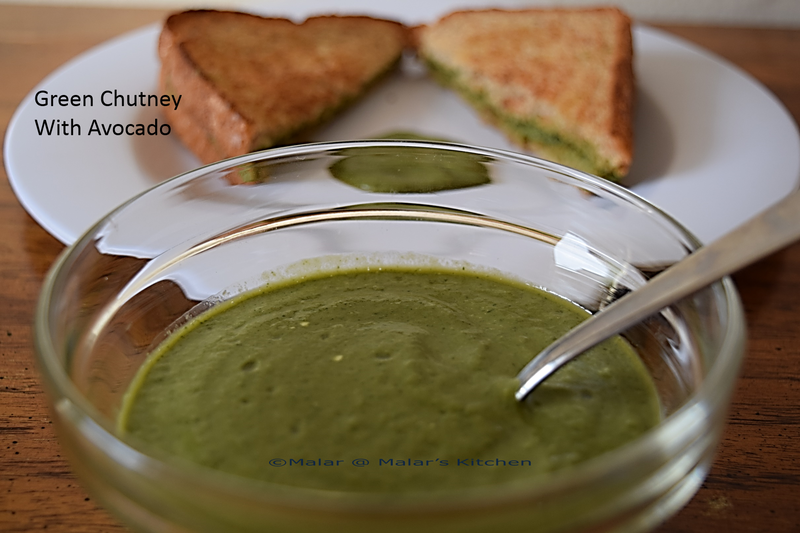 It goes great as a sandwich spread, dip for chaat, samosa, pakora. I tried it with an addition of avocado. It came out really well. Clean cilantro leaves, mint leaves. Peel ginger skin. Cut the green chili. Scoop avocado. In a blender, add all the ingredients and make it a fine paste. This can be stored in refrigerator for 3 days. Lemon juice helps retain the color. I served as a spread for bread toast. 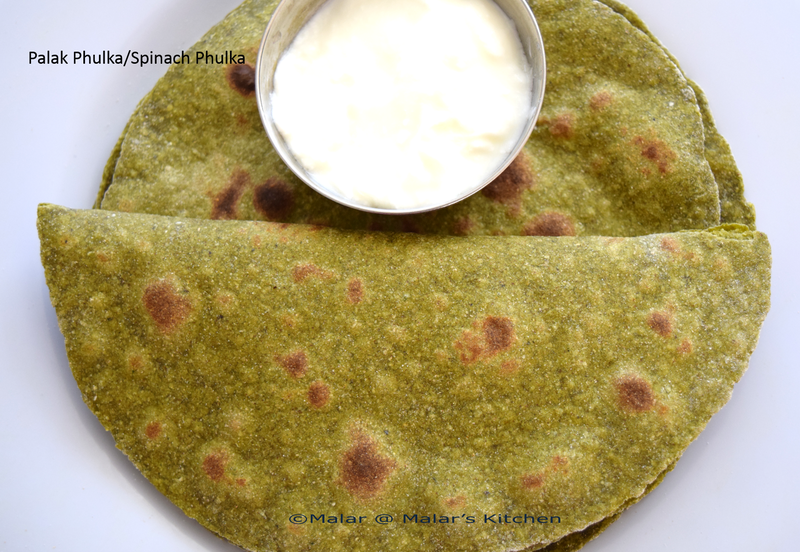 This is a versatile recipe which can be used as a side dish for any Indian items. I have been asked to include more of spinach in my food these days. 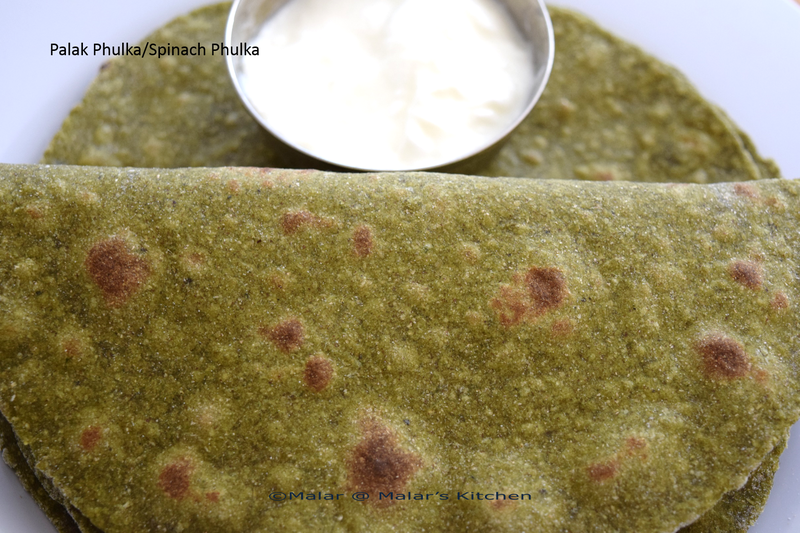 I have so many spinach recipes and always wanted to try spinach phulka’s. This is not a new recipe though 😉 Just that I have tried assembling multigrain atta with all the flours that I have. 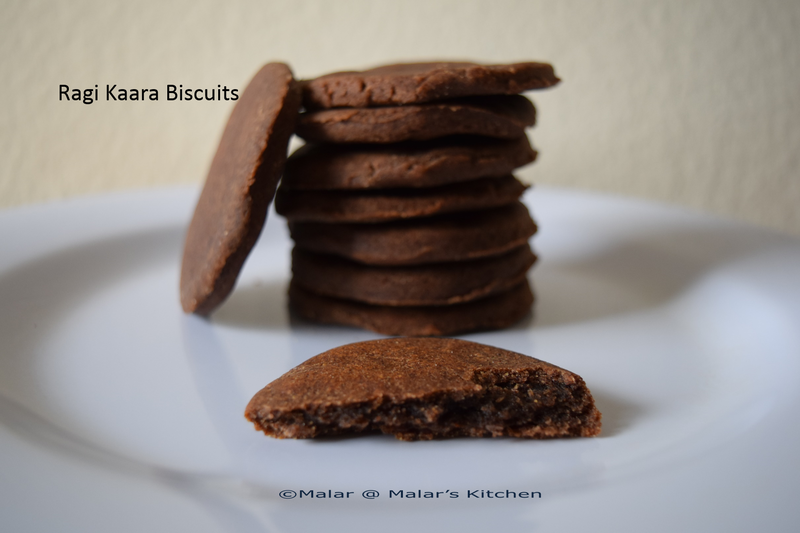 I did some googling to find out how to make multigrain atta at home. Almost everyone gave the same proportion. I had all the flours available at home except for channa dal flour. I just replaced channa dal with Bajri flour/Millet flour. The proportion is whole wheat flour is 2.5 cups and other grains totaled to 1 cup. So here is how I made it. 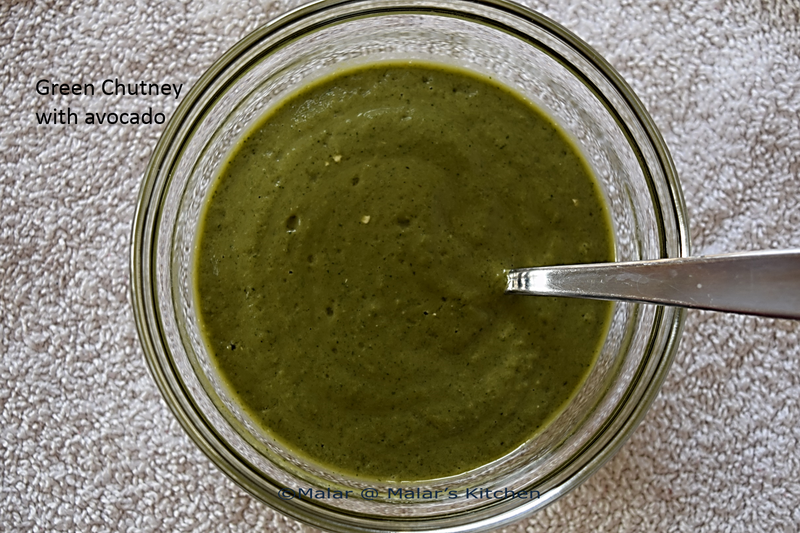 In a medium bowl, mix multigrain atta, the ground spinach, pepper powder, cumin powder, salt. Make a soft dough out of it. Rest it for 15 mins. Next make balls out of this dough. Then roll the balls dusting a little flour into round shape with a rolling pin. 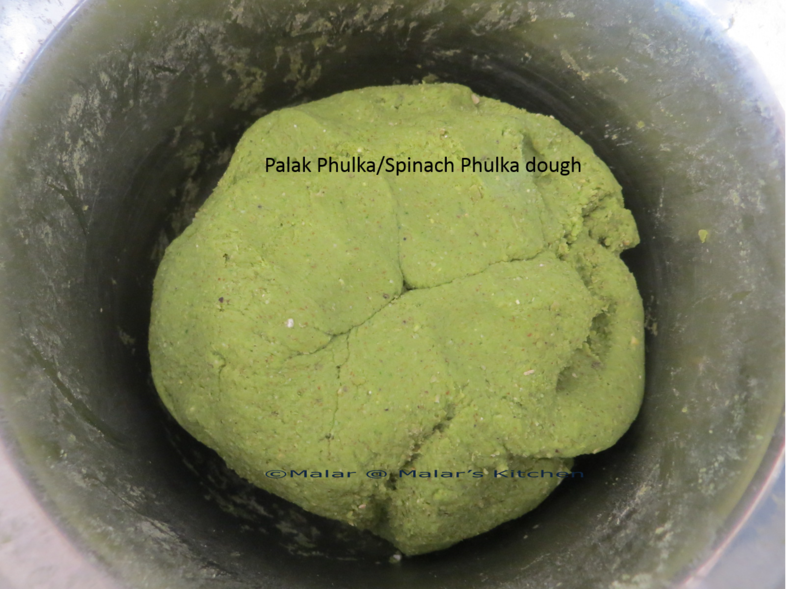 Heat a griddle, when hot place these phulka’s and cook well on both sides. Transfer to the roti puffer and cook both sides. You can also use oil or butter to cook instead of roti puffer. Serve with any of your favorite gravy or yogurt. 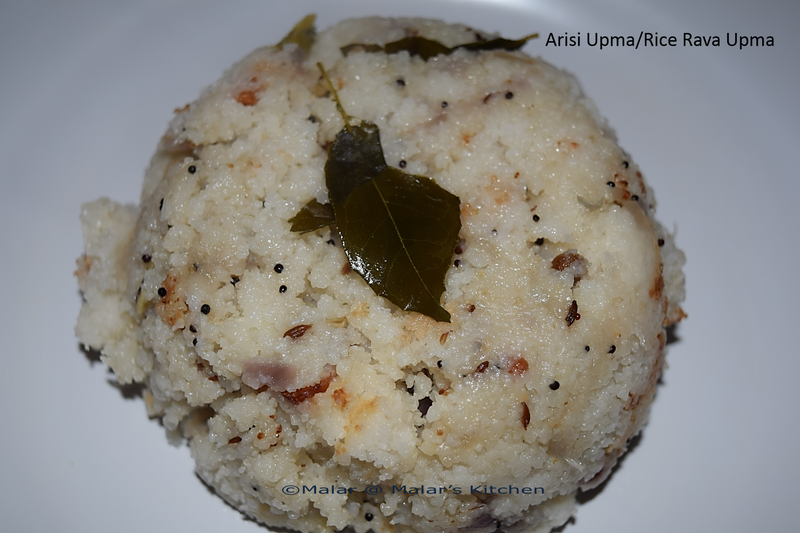 Rice rava upma/arisi upma is one of my favorite. 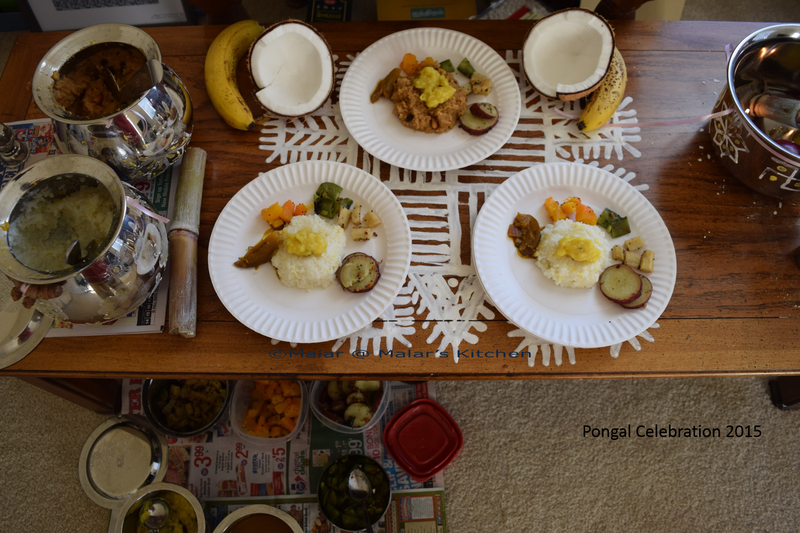 I used to love it when my grandma prepares it. My hubby somehow doesn’t like it, he used to say I make it very dry. So I changed my way of preparation and finally could make him say it is good 😀 YAY!!! I used to make it in pressure cooker and it always used get a little dry and stick to the bottom. That is majorly because I use less oil 😛 So I tried the way my grandma makes it in normal pan rather than pressure cooker. That made a lot of difference. Also continuous stirring in medium low flame helps getting better result. Heat oil in a pan. When hot add mustard seeds, urad dal, cumin seeds, channa dal. 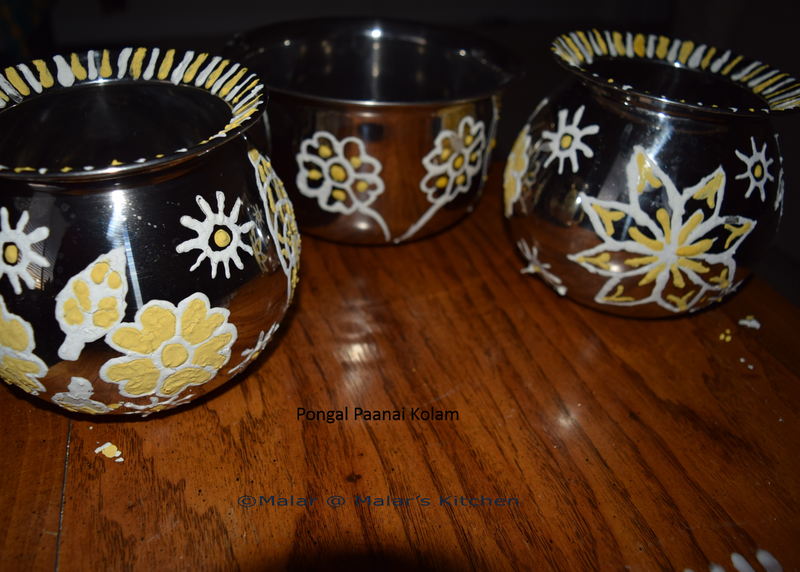 When it crackles and changes to golden brown color, add curry leaves. Let it splutter. Now add onions and green chili. Saute till translucent. In case you are adding veggies, add now saute till half cooked. Next add water and salt. Throw the ginger along with it. When the water boils well. Now add the rice rava and stir. Make sure to stir so that lumps doesn’t form. After 4 to 5 mins, reduce to heat to medium low. Open lid and make sure to stir for every one minute until the rice rava gets cooked well. It might start get stuck at the bottom, so reduce flame and cook. It should get ready in 10 mins. Finally add grated coconut and stir, this is totally optional. Leave over the stove top with closed lid for 15 to 20 mins (without heat). 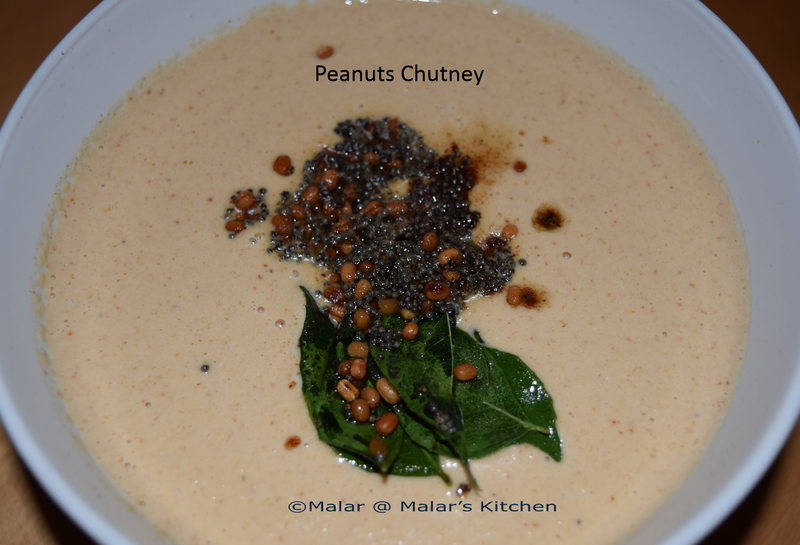 I have never been liking peanuts until I started having this chutney. My hubby loves peanuts on the other hand. When ever we are on flight or any trips his major snack would be roasted peanuts. I somehow never developed that liking for peanuts. 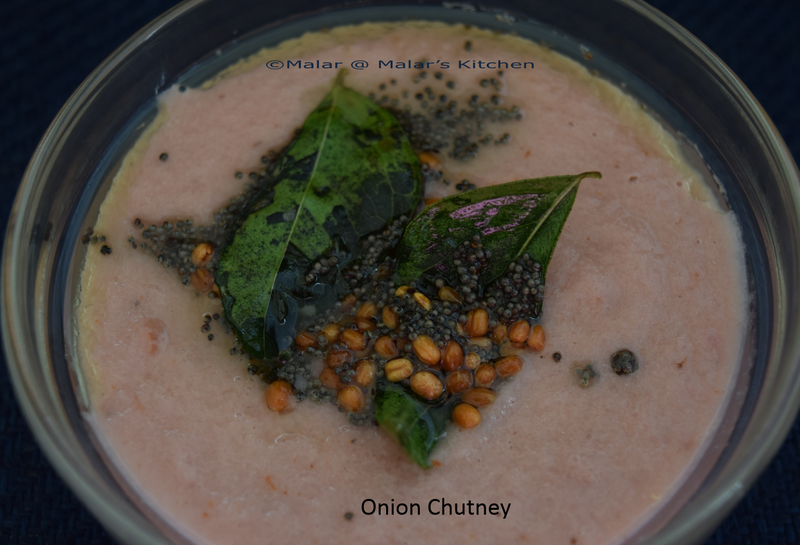 When I saw so many people discussing on this chutney, I felt I should give it a try some time. And I absolutely loved this chutney. Of all the chutney’s I prepare peanuts chutney has now become my favorite 🙂 A very simple chutney and goes well with any South Indian breakfast. I have adapted this recipe from vahchef. In a pan, heat half a teaspoon of oil, when hot add the roasted peanuts. Saute well for 3 to 4 mins. Soak tamarind in water and make juice. When it turn slight golden brown, stop heat and add red chili powder, tamarind juice. 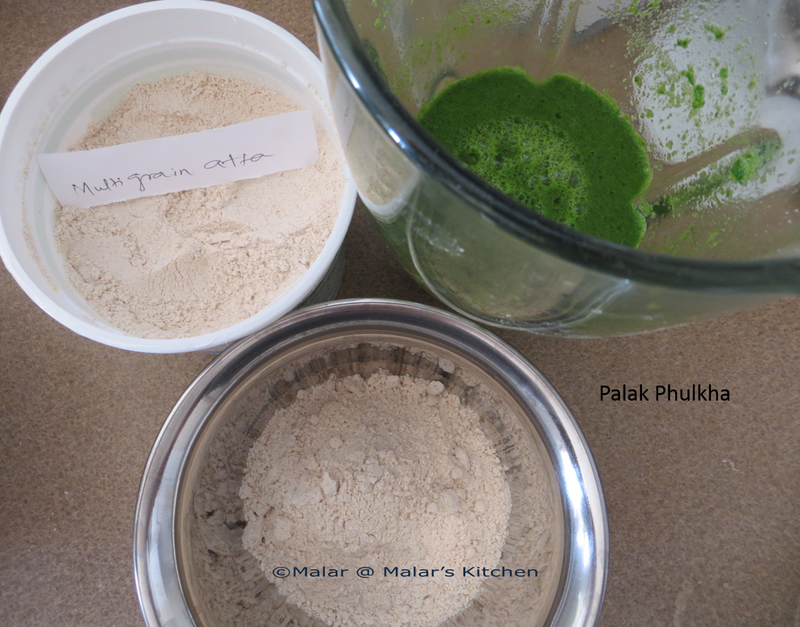 Next in a blender/mixer, add the above along with salt , water and grind it to chutney consistency. In a small pan, heat remaining oil. When hot add mustard seeds, urad dal, cumin seeds, asafoetida. Let it splutter. 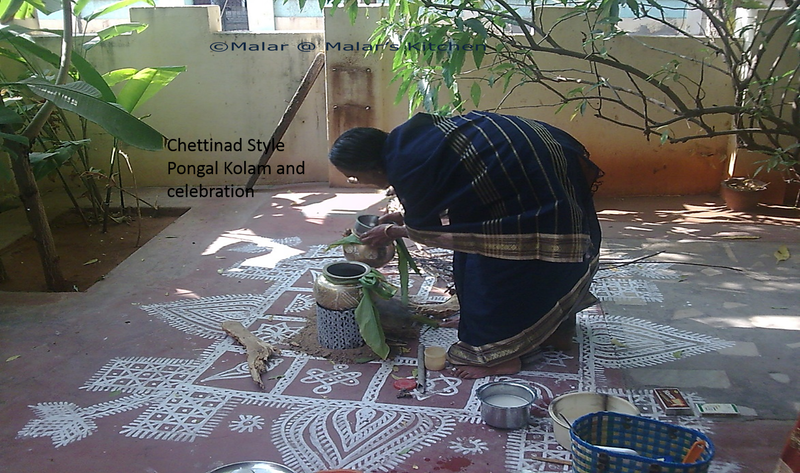 Finally add curry leaves and stop, add this is to the ground chutney. 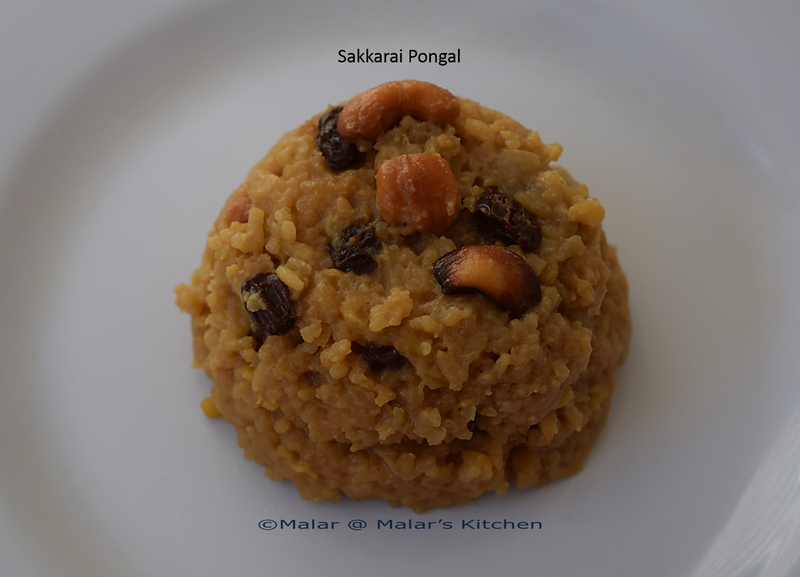 You can serve this with Idli/Dosa, Upma, pongal. 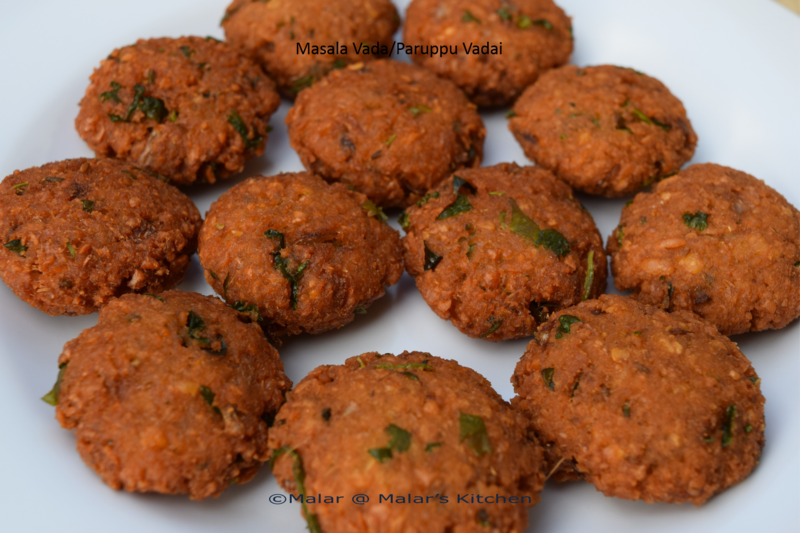 I always feel this is the easiest recipe of vada variety. It would never go wrong 😛 Any tea shops in Tamil Nadu, you can find masala vada at anytime. A great tea time snack. I can eat this even with yogurt rice 🙂 Lots of variation can be done with this. We can add spinach, veggies etc. 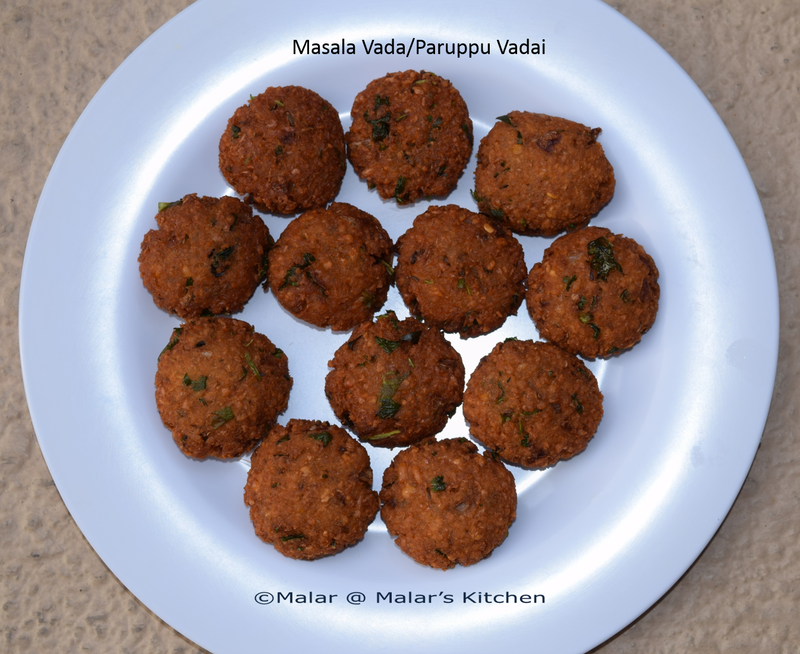 This is the basic vada recipe. Soak channa dal in water for minimum 4 hours or overnight. Then drain water and grind the dal with garlic, ginger, fennel seeds and red chili. Make it a coarse paste. Add very minimal water while grinding. 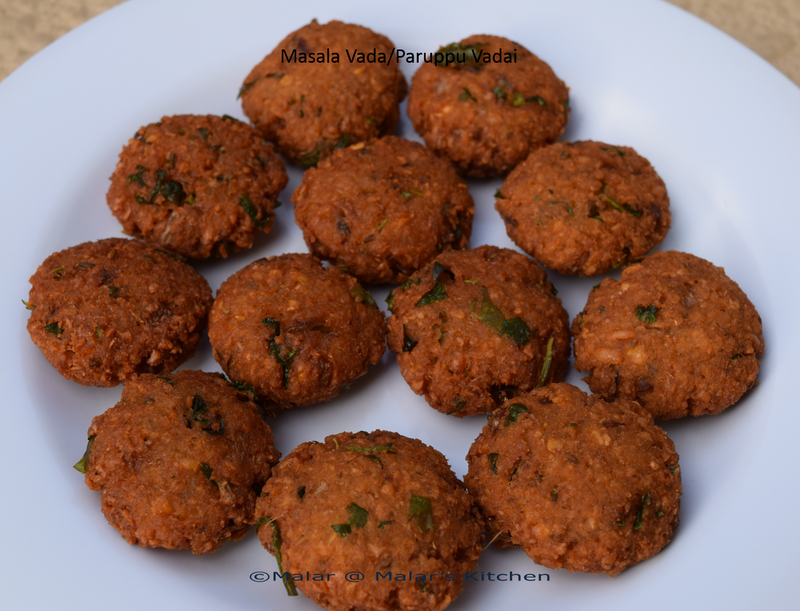 When you are ready to fry the vada’s, add salt, asafoetida, chopped cilantro leaves, chopped curry leaves with the batter and mix well. Heat oil in a heavy bottomed pan. Make sure the oil is heated in medium flame. To check if oil is ready, put a small drop of batter and it should come up immediately. Now take a small ball of batter, flatten it between palms ,slide it in to the oil and deep fry it on both the sides. When you slide the vada, make sure the first side cooks for at least 2 mins, then turn over to the next side. 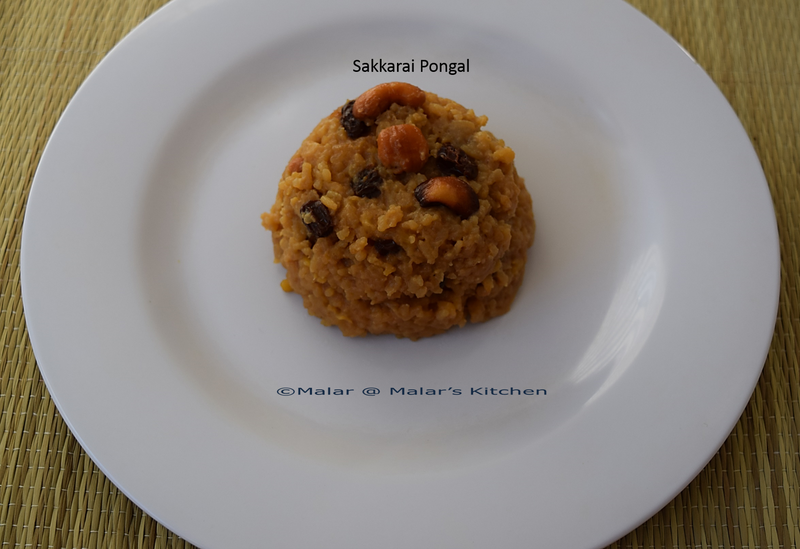 There are chances that the vada might break, if turned without cooking properly. 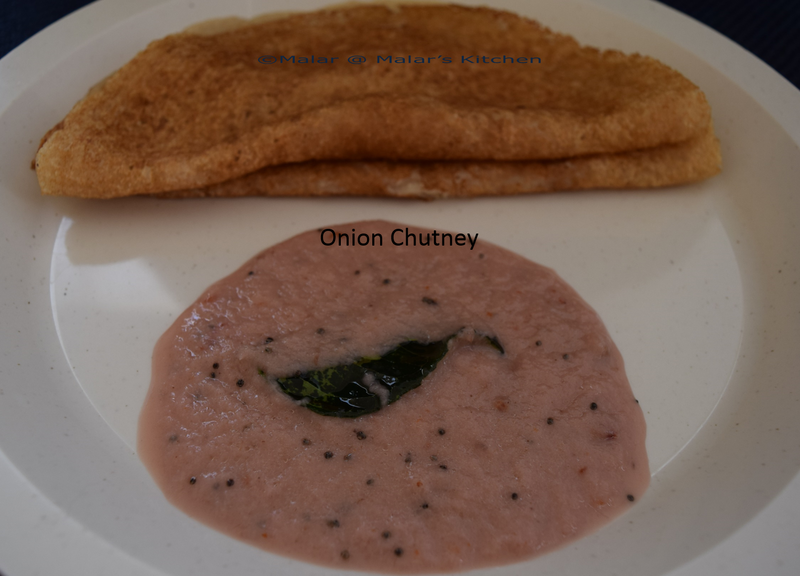 This is one of the most simplest chutney that I love. This has the slight sweetish and quite a spicy taste. When ever you want a nice spicy chutney for idli/dosa/adai/oats dosa do give this as an accompaniment, it tastes best together. Peel the skin of shallots or onion and dice to small pieces. Heat half a tablespoon of oil in a pan. When it is hot add the red chili by breaking it. Next add the pieces of onion/shallots and mix. After 3 to 4 mins, add the tamarind paste and mix. Let onions turn translucent. When it is almost pink in color, stop and let it cool. Put it in a mixer and grind it well with water and salt to a fine paste. Check for salt and adjust accordingly. Now heat the remaining 1/2 tablespoon of oil in a small pan. When hot add mustard seeds, urad dal. 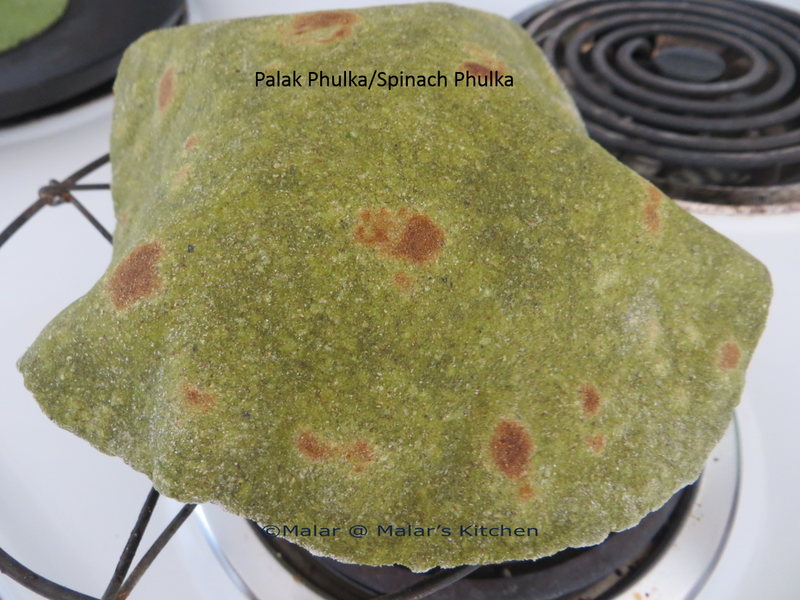 Let it splutter and urad dal turns slight golden brown. Add the curry leaves and when it splutters, mix this in the chutney.